As usual, there was plenty of "madness" in March, and this year did not disappoint. Although growth appears to be slowing both here and internationally, corporate profits are not falling off a cliff, and earnings remain near record highs. 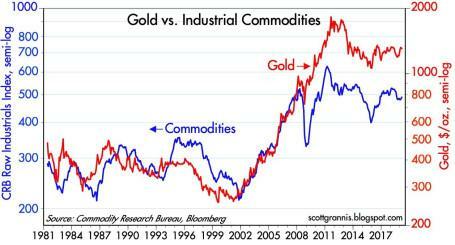 Not only have commodity prices remained stable in the face of slowing economic data, but gold prices have not spiked as they did during the last financial crisis. The volatile ending to 2018 and triumphant beginning to 2019 is a reminder that "March Madness" does not need to bring sadness… it can bring gladness. As usual, there was plenty of "madness" in March, and this year did not disappoint. Just as is the case with the annual NCAA basketball tournament, certain investors suffered the agony of defeat in the financial markets, but overall, the thrill of victory triumphed in March. So much so that the S&P 500 index posted its largest first-quarter gain in more than 20 years. Not only did the major indexes post gains for the month, but the winning record looks even better for the year-to-date results. For 2019, the S&P 500 index is up +13.1%; the Dow Jones Industrial Average +11.2%; and the tech-heavy NASDAQ index +16.5% for the year. The monthly gains in the major indexes were more muted, ranging from 0% for the Dow to +2.6% for the NASDAQ. While 2018 ended with a painful injury (S&P 500 -6.2% in Q4) on fears of a deteriorating China trade deal and a potentially overly aggressive Federal Reserve hiking interest rates, the stock market ultimately recovered in 2019 on changing perceptions. Jerome Powell, the Federal Reserve Chairman, indicated the Fed would be more "patient" going forward in increasing interest rates, and President Trump's tweet-storm on balance has been optimistic regarding the chances of hammering out a successful trade deal with China. With the new cautious Fed perspective on interest rates, the yield on the 10-year Treasury note fell by -0.28% for the quarter from 2.69% to 2.41%. In fact, investors are currently betting there is a greater than 50% probability the Fed will cut interest rates before year-end. Moreover, in testimony before Congress, Powell signaled the economic dampening policy of reducing the Fed's balance sheet was almost complete. All else equal, the shift from a perceived rate-hiking Fed to a potentially rate-cutting Fed has effectively turned an apparent headwind into tailwind. Consumers are benefiting from this trend in the housing market, as evidenced by lower 30-year fixed mortgage rates, which in some cases have dropped below 4%. Here in the U.S., the widely followed monthly jobs number last month only showed a gain of 20,000 jobs, well below estimates of 180,000 jobs. This negative jobs surprise was the biggest miss in more than 10 years. Furthermore, the overall measure for our nation's economic activity, growth in Gross Domestic Product (GDP), was revised downward to +2.2% in Q4, below a previous estimate of +2.6%. The so-called "inverted yield curve" (i.e., short-term interest rates are higher than long-term interest rates), historically a precursor to a recession, is consistent with slowing growth expectations. This inversion temporarily caused investors some heartburn last month. If you combine slowing domestic economic growth figures with decelerating manufacturing growth in Europe and China (e.g. contracting Purchasing Managers' Index), then suddenly you end up with a slowing global growth picture. In recent months, the U.S. economy's strength was perceived as decoupling from the rest of the world; however, recent data could be changing that view. Fortunately, the ECB (European Central Bank) and China have not been sitting on their hands. ECB President Mario Draghi announced three measures last month that could cumulatively add up to some modest economic stimulus. First, it "expects the key ECB interest rates to remain at their present levels at least through the end of 2019." Second, it committed to reinvesting all maturing bond principal payments in new debt "for an extended period of time." And third, the ECB announced a new batch of "Targeted Long-Term Refinancing Operations" starting in September. Also, Chinese Premier Li Keqiang announced the government will reduce taxes, primarily Value Added Taxes (VAT) and social security taxes (SST). Based on the rally in equities, it appears investors are optimistic these stimulus efforts will eventually succeed in reigniting growth. Mueller Report Completed: Robert Mueller's Special Counsel investigation into potential collusion as it relates to Russian election interference and alleged obstruction of justice concluded. Michael Cohen Testifies: Former President Trump lawyer, Michael Cohen, testified in closed sessions before the House and Senate intelligence committees, and in public to the House Oversight Committee. In the open session, Cohen, admitted to paying hush money to two women during the election. Cohen called President Trump a racist, a conman, and a cheat but Cohen is the one heading to jail after being sentenced for lying to Congress, among other charges. North Korea No Nuke Deal: In geopolitics, President Trump flew 21 hours to Vietnam to meet for a second time with North Korean leader Kim Jong Un on denuclearization of the Korean peninsula. The U.S. president ended up leaving early, empty handed, without signing an agreement, after talks broke down over sanction differences. Brexit Drama Continues: The House of Commons in the lower house of the U.K. Parliament continued to stifle Prime Minister Theresa May's plan to exit the European Union with repeated votes rejecting her proposals. Brexit outcomes remain in flux; however, the European Union did approve an extension to May 22 to work out kinks, if the House can approve May's plan. March Madness reminds us that a big lead can be lost quickly; however, a few good adjustments can also swiftly shift momentum in the positive direction. 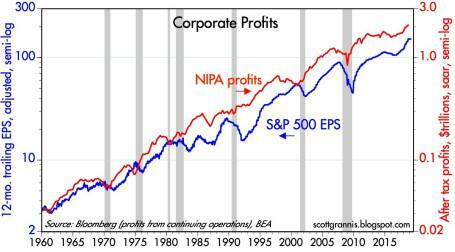 Although growth appears to be slowing both here and internationally, corporate profits are not falling off a cliff, and earnings remain near record highs (see chart below). After 2018 brought record growth in corporate profits and negative returns, 2019 is producing a reverse mirror image - slow profit growth and record returns. The volatile ending to 2018 and triumphant beginning to 2019 is a reminder that "March Madness" does not need to bring sadness… it can bring gladness. This article is an excerpt from a previously released Sidoxia Capital Management complimentary newsletter (April 1, 2019).